Justin Pen reports on the rally commemorating the 10th anniversary of T.J. Hickey’s death. Upwards of two hundred people gathered at the corner of George Street and Phillip Street in Waterloo on February 14 to protest the involvement of the police in the 2004 death of Thomas James ‘TJ’ Hickey. Hickey, 17 at the time of his death, was impaled on a fence while attempting to evade police on his bicycle. 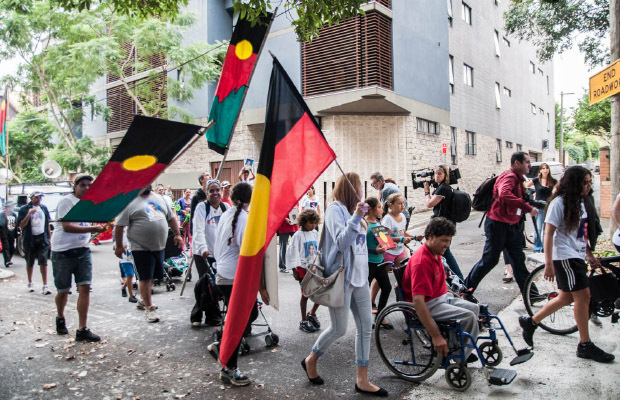 Aboriginal elders, Redfern community members and the Hickey family attended the rally, marking the tenth anniversary of Hickey’s death. Hickey’s relatives and local residents spoke on police violence, discrimination, and demanded the coronial inquest be reopened. “I want the plaque on the fence, I want a new inquest re-opened, and I want an apology from the NSW government,” Gayle Hickey, his mother, said. The rally moved from Waterloo to Redfern Police Station, Central Station, the Office of the Director of Public Prosecutions, and concluded in front of NSW parliament, where the crowd of protesters swelled to approximately three hundred people. Although the protest was otherwise peaceful, an altercation between protestors and police occurred on Chalmers Street, near Central Station, when police attempted to apprehend a young man who had wandered beyond the approved protest area. David Clarke, one of the rally’s organisers and member of the Indigenous Social Justice Association, reported that police “grabbed him [and] pushed him to the road,” before attempting to arrest him. Police surrendered the young man to the crowd, after refusing to disclose what charges would be laid. Greens MLC David Shoebridge, who attended the rally, noted the extensive police presence that accompanied the march. “I never see this level of police unless the rally is about Aboriginal people,” he said. The coroner’s report attested that police officers pursued Hickey, thinking him to be another man, Christopher Carr, a suspect in a case of serious assault and robbery. “[It is] common ground that TJ Hickey looked nothing like Christopher Carr, beyond the fact they were both Indigenous Australians,” the report said. Shoebridge described the inquiry into Hickey’s death as a damning case of “police investigating police”, saying that the coroner’s report had failed to take into account various pieces of evidence. He listed eye-witness testimony, the implications of improper administration of first aid by officers on the scene, and forensic evidence regarding Hickey’s bicycle as noteworthy omissions. Other speakers touched on broader issues facing Indigenous people. According to a report by the Australian Institute of Criminology, the incarceration rate of Indigenous persons has almost doubled over the last two decades, from 14 per cent in 1991, to 26 per cent in 2011. “We jail Indigenous Australians more than Americans do African-Americans,” said Gerry Georgatos, a reporter for the National Indigenous Times.